He was an English Romantic landscape painter in the 1800s, which may not sound very exciting, but Turner was in fact known for his radical and completely original approach to painting. 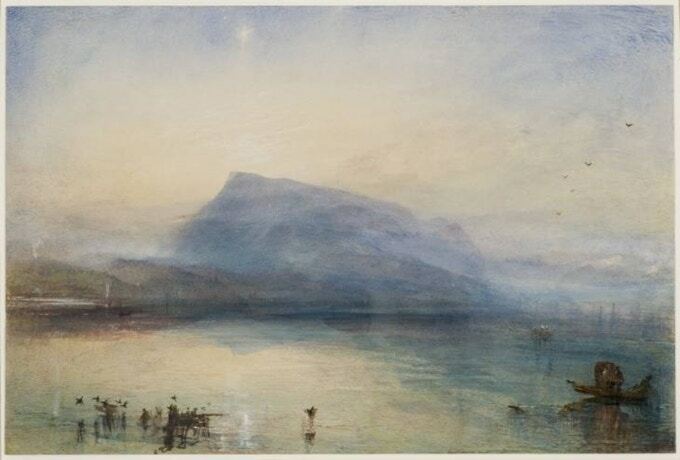 A controversial artist also known as the “Painter of Light”, Turner altered the way we view painting forever, and opened up new possibilities for the rest of art-making. And that in itself is one of the most exciting things about him as an artist. Our painting celebration has also come at the perfect time, as the new film Mr. Turner is set to be released on 31st October. Directed by Mike Leigh and starring Timothy Spall, Dorothy Atkinson and Paul Jesson, the film focuses on the last 25 years of the eccentric artist’s life; his relationships, his travels, and of course his art-making - his watercolours, his oil painting, and his sketchbooks filled with many drawings. The director has quite rightly described Turner as “a great artist: a radical, revolutionary painter”, and to celebrate the release of the film as well as Turner’s own legacy, we have partnered with the film to offer you an exclusive ticket offer. If you go and see Mr. Turner at any Picturehouse Cinema, you will receive a free glass of wine. You’ll get the voucher if you buy anything at Cass Art, in-store or online, and you simply need to take the voucher along when you buy your ticket. You can also use it to get a bottle of beer or soft drink. Tim Wright is an accomplished portraiture artist, represented by Shine Artists London. The painting consultant for the Mr. Turner film, Wright worked closely with actor Timothy Spall and taught him how to paint for his scenes, so he was believable as a painter on-screen. He also taught many of the other actors from the film (who were playing artists), hosting life-drawing sessions in his own studio in London. After filming, Timothy Spall then sat for Wright and got his own portrait painted, which Wright then exhibited this year in the BP Portrait Award. As part of our Paint Light Colour campaign, Tim Wright will be hosting an painting talk in our Islington Flagship this month. Watch this space for the confirmed dates so you can book your place. If you think Turner’s paintings are classical and old-fashioned, you may be surprised; he was in fact famed for his radical, experimental approach to art when he was working in the 1800s. Keep your eyes open for our Turner fun facts and the history behind his paintings – from the story of his infamous red splodge to his dramatically emotional landscapes. After all, the Turner Prize was named after him for a reason; he was about being different, about doing things that weren’t the norm for art. He subverted expectations and pushed the boundaries of what painting could be, and for that, all artists owe him one. We want to tip our creatively-freed hats to the eccentric Mr. Turner, and celebrate all things painting in his name. Visit our Mr. Turner page to explore the art materials, interviews and other Paint Light Colour features.